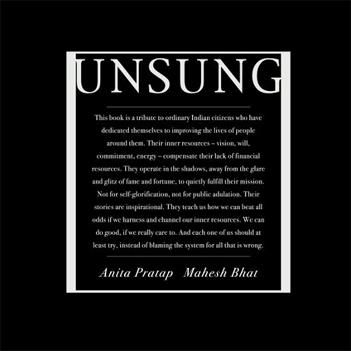 UNSUNG began in 2004 as a tribute to ordinary Indian citizens who have dedicated themselves to improving the lives of people around them. 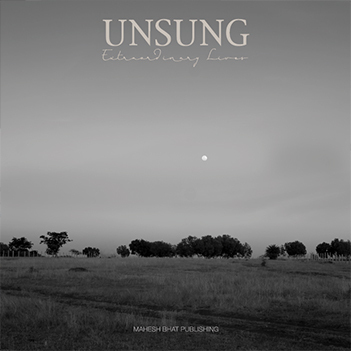 The first volume in the project, titled UNSUNG, was published as a response to our celebrity-led hero culture. It assumed the mantle of a catalyst for change when it helped raise over ₹9 million to the causes of the heroes we featured. Readers wrote to tell us how it inspired them. The thoughts, words, and deeds of our heroes are always aligned. They speak their mind and do what they say, 24X365. And the measure of success is their own. Without exception, each of these heroes shares these two qualities, and I think that has a big role to play in their achievements. There is something heroic about their convictions and their strength to stand by them. By their example, anyone can be a hero; one doesn’t need to create ripples in the world. Often, our heroes come in the form of friends and acquaintances who enter our lives, create a profound impact, and transform us. They bring about change by being a mirror to our thoughts and ideas. The second volume of UNSUNG is dedicated to these heroes—friends, relatives, and acquaintances who have transformed our lives. The second book in the series, UNSUNG-Extraordinary Lives, was published in 2016, and features stories of seven heroes from across India. Some of the country’s top photographers including Amit Mehra, Dinesh Khanna, Jyothi Karat, Namas Bhojani, and Prashant Panjiar have collaborated with Mahesh Bhat to produce the book. Social scientist Amita Baviskar, Geshe Dorji Damdul, director of Tibet House- Cultural Center of H.H the Dalai Lama, activist Madhu Malhotra, journalists Saritha Rai, Radhika Bordia, and Sugata Srinivasa Raju have also written essays. The great organic farmer Masanobu Fukuoka’s estate granted permission to use a chapter from his book The One-Straw Revolution in the second volume. 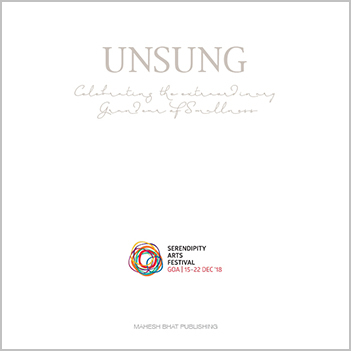 The third volume of the UNSUNG project was the exhibition, “Celebrating the Extraordinary Grandeur of Smallness” commissioned as an exhibition by Serepndipity Arts Foundation for the Serendipity Arts Festival, 2018 at Goa.